The life of a full time caregiver to a child with a life-limiting illness is hard. Damn hard. Now, before anyone sends private messages to me that I need to look at the positive side, let me reiterate that I could not have made it 11 plus years on this journey – alone – were it not for me being a positive, optimistic, glass half full kind of woman. So, moving on from there. The life of a full time caregiver to a child with a life-limiting illness is hard. Damn hard. Yes, I know, I repeated myself. There are costs associated with this journey, and I am not referring to the financial costs, although we all know those are great as well. I am instead referring to the emotional, physical and psychological costs. It is these costs, that if not tended to, can lead to a breakdown of the caring role, support within the special needs community, and the family. I personally have been on this journey with my son Brendan Bjorn for over 11 years. As a single mother, and an “older” mother at that, it has taken its toll on me. Physically, my back is pretty much shot thanks to degenerative disks in my lower back. And, I have arthritis. And, I just turned 50 in December (yes, I know…ugh!). While I have committed myself to exercising daily and getting in better shape, this life can be restrictive of that happening because people in my shoes can’t just grab their kids and go for a hike (like I used to do every weekend and that is something I desperately miss…bring in the emotional and psychological costs of this journey here), go for a run, hop on a bicycle or go to a gym. Most of us parents continue to lift our disabled child – unless of course we happen to be one of the very few blessed ones who live in a house that allows for a lift to fit through doorways and a shower room that is adapted for a disabled child and a lift system. Personally, I have never had that, so, it is my body that is the lift to his 33 kilos (73 pounds)…and there is one cost in caring: Down the road, it will be parents like me who will suffer physical ailments because of the lack of assistance given to us, primarily by the government not recognising the short and long term benefits and/or consequences of them not caring to provide the assistance we desperately need. We need our government to care, not only for our fragile children, but for us, the parents who are on the front line every day and every night. WE are also in need of help to safeguard our own health and wellbeing. This is one of the costs, one of the tremendous costs, of us caring, and them not caring. It has been said to me in the past that I should just put my son in a residential home and get on with my life, get on with my dreams. It has been said to me in the past that I should have aborted my son (I didn’t know, by the way, that he had severe brain damage until he was a month old…not that it would have changed anything). I have been told that he has no quality of life, so when he dies, well…it’s for the better, isn’t it. I’ve learned over these 11 years that comments such as these speak to the lack of understanding by the people who said them. They don’t see the beauty in this journey. They haven’t had their soul touched by unconditional love like I have. And for that, I feel sorry for them. Having said that, comments such as those do take their toll emotionally as we care for a child that ultimately we know we will lose. We need supported, not knocked back. Within the special needs community there is also an air of not caring. Maybe it is better termed as an underlying level of competition. I don’t blame the parents…for the most part…but instead, again, the government who only provides scraps of assistance which leaves all of us clawing and fighting for whatever we can get. It should NOT have to be this way. 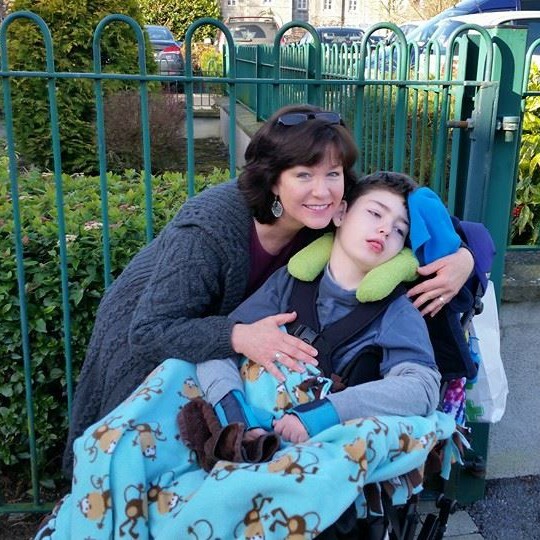 All of us who have a profoundly disabled, medically fragile child such as my son should be able to regularly receive respite, including overnight respite either in home if it best suits the child’s needs, or in an appropriate respite centre. We are physically, emotionally and mentally exhausted much of the time. And for those of us with no family support, it is compounded. In the long term, if the government continues to ignore our needs as well as our special children, it will be our generation who will be knocking at their door needing services down the road. Preventative care is less costly (on all levels) than waiting until problems exist. Our special angels are just as valuable as healthy, able-bodied children. We caregivers who are unable to work outside the home because of our fragile children are just as valuable as those parents who are out there in the workforce paying taxes. And let it be heard clearly, I don’t know anyone among us who wouldn’t prefer to be back out in the workforce, continuing our careers, having daily interaction and conversation with fellow adults and professionals. I for one miss that tremendously. This is yet another cost worthy of being noted, for it also weighs on us parents, emotionally and psychologically, who had a career we have been required to put on hold in order to care for our child. And when the time comes that our angel transitions, some of us will have a gap of years where we’ve not been active in our professional field yet must then jump straight back into the workforce after our child dies. Can you imagine how difficult that will be? Will our government be there to help with this monumental transition if they are not even present to help see us through our current challenges? There is a great cost in caring. But there is a greater cost in NOT caring. THE CHOICE SHOULD ALWAYS BE MADE TO CARE. I’m going to diverge from my usual focus of writing about life with a child that has a life-limiting illness, and I’m going to focus this piece on something that has recently occurred within the “special needs writing world” that has caused a division. I tried for a few days to bite my tongue, but there were so many comments thrown around that caused hurt and offense among our community, I find myself having to speak out. A few weeks ago, a wonderful website called themighty.com that has published a number of my pieces became the target of one of the many varying groups within the large special needs world. I’m not going to get into that aspect of the matter, but I am going to address some of the highly inflammatory accusations made by this special needs group toward parents like myself: That we cannot be voices for our child with special needs because we don’t know what it feels like to be in his/her shoes; That we write for pity or attention or other self-seeking reasons, and; That we use the “wrong” language when describing our children’s conditions or disabilities. No one knows exactly what my journey is like because it is mine alone. My perception of it, of life, of death, of my son, of doing this as a single parent, etc…all of that and more contributes to how I walk this journey and how it is seen by me. Others may closely relate, and I know many who do, but having said that, it’s impossible for someone that walks a totally different special needs journey (for example, has autism) to really grasp this journey I am on with my son. Equally so, I cannot really grasp the life with autism. Point being: it is unfair and ungrounded for anyone not walking in “our” shoes to criticise why or how we write when it comes to our unique journey. I do speak for my son. Full stop. End of story. A person not walking on this same journey cannot say, or should not have said, that we cannot speak for our severely disabled children. I find it especially ironic that those who are saying this can in fact speak and write and do for themselves…and thankfully so. If only they could see the irony, too. You see, I have a son who has never held up his own head longer than 2 minutes. Never. And he is 11 years of age. He has never sat up on his own. He has never walked. He has never talked or written a word. He is fed through a tube surgically placed in his stomach. His brain is severely damaged and he experiences seizure activity on a daily basis. He grows weaker every year, with the last 3 years showing continued decline. And, I will bury my son. My beautiful, amazing, pure, innocent son who is an angel on earth. So do I speak for him? Yes, by all means, I do. Can I tell you how he feels? In fact, I often can and I am right when I do. Can I tell you when he is happy or sad or in pain or scared? Again, yes I can. I will continue to speak for my son, because he has no other voice. I am his voice. In speaking for my son, I have done everything from save him from grave medical errors to help save babies yet to be born from being affected by the same virus that damaged his brain. In speaking for my son, I have connected with families and helped them connect with others so that we are not feeling so alone as we walk this often painful path. And, selfish it may be, but writing about this journey helps me process this journey…helps me be strong – for him. This is his legacy, not mine, that is being formed here, and that is worth any dissension from other groups within the special needs community. At the end of the day, those of us in the special needs world would do well to keep in mind that there are so many different conditions, disabilities and abilities, that we cannot lump everyone together and expect us to all use the same language, have the same thoughts or feelings, or even write for the same reasons. We just can’t…and those that think we can, I would boldly suggest they need to re-evaluate their own perspective. There is enough division and heartache in the world. We don’t need to create any more within our own special community.